An important part of designing a new bathroom is taking time to figure out how much the bathroom will cost and what you should expect from your budget. Establishing a solid idea of bathroom costs before you start choosing any sanitaryware is crucial – nobody wants to be stung by forgotten labour fees. Our specialist guide helps you figure out your bathroom remodel cost, taking into account everything from the price of fittings and fixtures, to the amount you should expect to pay contractors. This is an important aspect of the process of planning , designing and furnishing a bathroom that shouldn't be skipped – especially if you're sticking to a strict budget. The bathroom cost will depend on what you are doing. If you are building a new bathroom in an extension or moving a bathroom to a new room, expect to pay extra to connect to services such as the waste pipe, water and electrics. However, as a rough guide a complete bathroom remodel costs an average of £4,500, assuming you can connect to existing pipework. The majority of this will be in labour costs as do not forget that as well as plumbing and fitting, you need to account for tiling, flooring and decorating too. Sanitaryware costs vary widely depending. For example, a budget-friendly acrylic bath will cost as little as £70, while a mid-range bath will be £300 to £500. Expect to pay upwards of £1,000 for designer and statement baths, especially if they are made from cast iron, stone or composite materials. See more details on sanitaryware costs below. Are your bathroom remodel plans feasible for your budget? You will need to assess the feasibility of your plans at an early stage, bearing in mind that the location of the new bathroom will affect costs, as will changing an existing bathroom's layout. You might think that as an en suite is smaller it will cost less than a normal bathroom, but this isn't always the case. Unless you are adding the en suite in place of, or near an existing bathroom, connecting to the plumbing could be a cost-adding complication. This is often true of loft conversions where you should budget for additional plumbing work. Check out our guide for more detailed advice on adding an en suite. It's worth acquainting yourself with the basics of bathroom plumbing, too, so that you can make informed decisions. Use our checklist to think about the features you would like to include. It is hard to estimate costs for these elements so have a look around to see what is on the market – our bathroom storage ideas is a good place to start. Some storage may be built in by your bathroom fitter, so ask for costs for bespoke elements. Follow the links below to get an idea of cost breakdown for different flooring types and décor. How much does it cost to use an expert bathroom designer? A bathroom design specialist firm may work out a little more expensive than employing individual contractors, but you should find it easier to nail a fixed price with them up front – plus they will project manage the entire renovation for you. You should spend time discussing the space with your designer. ‘A site visit is imperative to take the dimensions of the room, check the direction of the floorboards, the heights of ceilings, and to measure water-pressure systems, along with observing the style of the house,’ David explains. If you’re working with a specialist bathroom company, the price should include all elements. The ideal place to start any project is with a fixed budget. A good company will then design and install to that figure. If you have decided to employ individual contractors for your project, ask for personal recommendations, and make sure that anyone you use is accredited. For builders, tilers, plasterers and electricians, look to trade organisations, such as the Federation of Master Builders, or government-licensed TrustMark. You can also find local electricians through trade bodies, such as NICEIC. For electrical, heating and hot-water contractors, visit ELECSA, while NAPIT provides a list of electricians and plumbers. You might have to upgrade your consumer unit if you have no residual current device on your electrics. An average cost would be £400 to £500. Expect to pay an electrician around £150 to £200 as a day rate. Try to get a fixed price from your plumber for the installation work, but ask at the same time how long the job will take. As a rough guide, a plumber will charge around £150 to £200 as a day rate. Expect to pay carpenters around £120 to £150 per day, although these rates – as with all others – will vary according to the specification of the job and where in the country you live. It's unlikely you'll need planning permission for a new bathroom, but if it’s part of a loft conversion, check whether this needs an approved application or falls under the permitted development regime. If you live in a terraced or semi-detached house, the party wall act may apply. Look at the Planning Portal and check with your local authority. If you’re putting a bathroom in a loft conversion and cannot carry out work under permitted development rights, budget £172 for a householder planning application in England. When making use of your permitted development rights, a certificate of lawful development costs £86 (England). See the Planning Portal for other fees. If your bathroom is in a loft conversion and the Party Wall etc Act applies, plus you need to employ a surveyor, factor around £850 per neighbour into your budget. If you’re converting the loft, building control fees are likely to be around £960 to £1,200 for a standard conversion. Otherwise, budget for around £300, but check with your local authority. A new bathroom may place more demands on your home's plumbing and heating systems. ‘Ensure that the boiler produces enough hot water for the new shower and bath,’ says Dorian Bowen, director of design consultancy Project One. ‘For an unvented system, go for a low-pressure thermostatic mixer or install a pump.’ Also, check that your water system will cope if the new bathroom is in the loft. You may have to upgrade your boiler to meet your new bathroom’s needs. According to the Energy Saving Trust, a straightforward gas boiler replacement will cost around £2,300. For an electric system for your new bathroom, factor in from around £14 to £22 per square metre. If your bathroom is going to include a wet underfloor heating system, the costs are likely to be from £36 to £48 per square metre. The location and size of your bathroom will affect the choices that are available, with off-the-shelf bathroom buys being much cheaper than bespoke pieces. If keeping the budget down is key, spend out on quality fittings and fixtures that will get lots of wear and tear: the taps, in particular, the toilet, the sink and the bath. You can save money by shopping online or waiting for the sales. Claw back more of that spend by swapping real stone tiles for cheaper lookalike porcelain, for example. The specification of the suite or individual pieces will have a big influence on your final costs, whereas plumbing costs will be much the same whether you choose a less expensive bath, basin and WC or designer fittings. However, if you are refitting an existing bathroom, remember that your final costs will also be influenced by the layout. 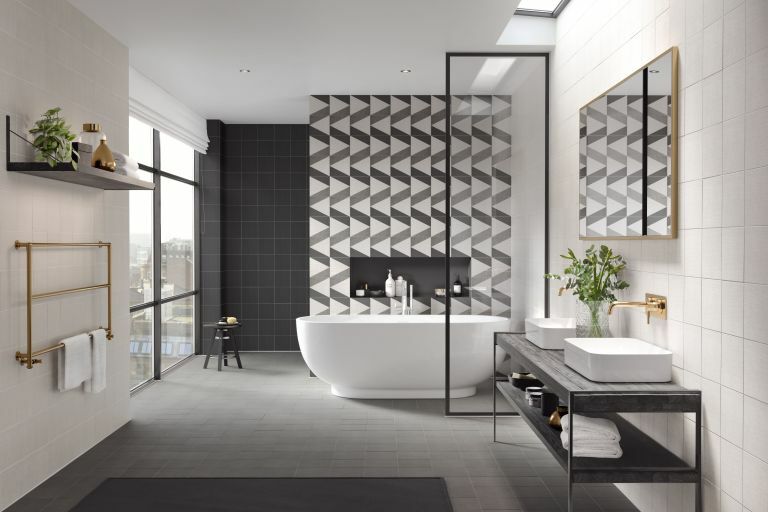 ‘Installation prices will vary depending on whether you are simply replacing items – such as removing an old sink and bath and installing a new one in the same place – or redesigning the bathroom,’ says David Smith. For a bathroom with WC, basin and bath, costs range from around £4,000 to around £10,500, depending on where you source the pieces. For a shower room with WC, basin and shower cubicle, budget from around £4,500 to around £11,000, depending on where you shop, from DIY stores to high-end showrooms. Once the sanitaryware is fitted, you'll need to set aside budget to tile the walls, add bathroom flooring and decorate the walls. If you are saving money by not tiling the full room, some of the walls will need painting, for which you will need a specialist bathroom paint that can withstand the moisture and be wiped clean. You should also use this to paint the ceiling. If you're looking for bathroom paint ideas, take a look at our gallery for inspiration. Finally, think about finishing touches like bathroom storage for make-up or towels. Fitted bathroom furniture is more expensive than freestanding solutions, and you can take the latter with you when you move house. Finally, set aside a little budget to add accessories to inject personality into the scheme. Here are some ideas to help you decorate your bathroom, whatever the budget. Tiling is a huge contributor to what can go wrong in a bathroom. Factor in the correct materials over using the cheapest product. If your project is a wet room, make sure that you use the right tanking system. If tiling is not part of your overall project cost, allow from around £28 per square metre upwards to cover it.